In the 8th administration year of Voxpop International school, we have once again vowed to move forward with zeal, enthusiasm and undying efforts to mould the lives of our students and give them a school life that they can look back to and smile. The academic year began with the teacher interface where the parent community was invited to meet, talk and bond with their child’s teachers. We believe that teachers are second parents and it is absolutely necessary that the child and his parents get to know their teacher and discuss with each other the growing process and the learning structure of a child. Our teachers have never let us down and have taken on point care of each and every student. For any school to run successfully, the parents, the teachers and the students need to celebrate a bond that nothing can break. In this age of modern leadership, it is necessary that schools encourage students to make decisions, participate and conduct events and feel accountable for their actions. Keeping this in mind, every year we conduct the student council elections where the student leaders put in their citations, get nominated and conduct themselves for the post they have applied for. In the month of June, one can find the school campus filled with campaign events and posters. Elections are held in a fair and dignified manner and the student leaders are elected. Student council elections are one event that the entire team of Voxpop looks forward to. For once students take over the responsibility of the school and teachers turn into mere spectators. 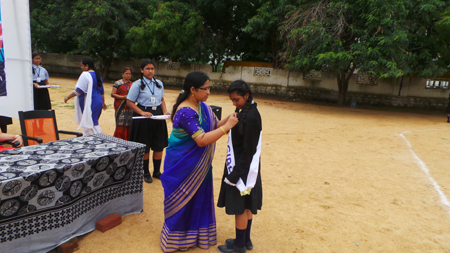 Alike any other government in the country, we follow the old school process of investiture ceremony and crown our students with their badges and declare to them their responsibilities. As a team we are all on the same page when it comes to allowing students explore their interests and try a hand in new things and if that is what it takes for a child to have a happy schooling and an overall growth, we always take the first step. Health is an important factor that plays a crucial role in the lives of every individual. Vitamins and nutrition is one concept that is effectively taught to PP students and as a part of this curriculum students were requested to bring balanced diet for one week straight. The age of 5 and above is a moulding age for little kids and we believe that right habits and positive things should be taught to kids at that age for a lifelong impact. Green day and sapling plantation is one activity we strongly take up each year telling our students the importance of green and clean nature. It is appreciable and commendable that our students have given in active participation and I am greatly thankful to my parent community for this immense support.